Dream it big, but keep it simple...with kids! Ellie, Tye, Jax and I (not pictured...Elizabeth and Caleb) at the Museum of Health for the Bug Exhibit! Sooo fun! 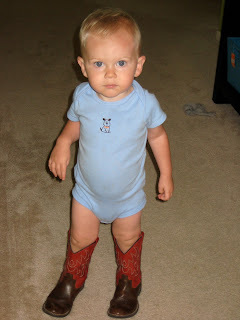 Here is my "oh so cute, baby in big boots picture" that we all have. These are actually Tye's boots. Tye was definitely sleeping, because he would not have allowed this. These are few of many pictures of my little traveling book worm. 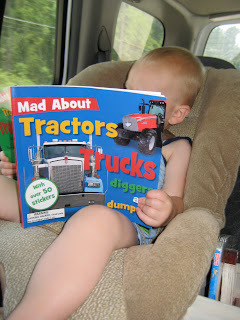 If we are in the car, he is studying his tractors, trucks and animals. We are finally back and caught up on sleep, laundry and errands. 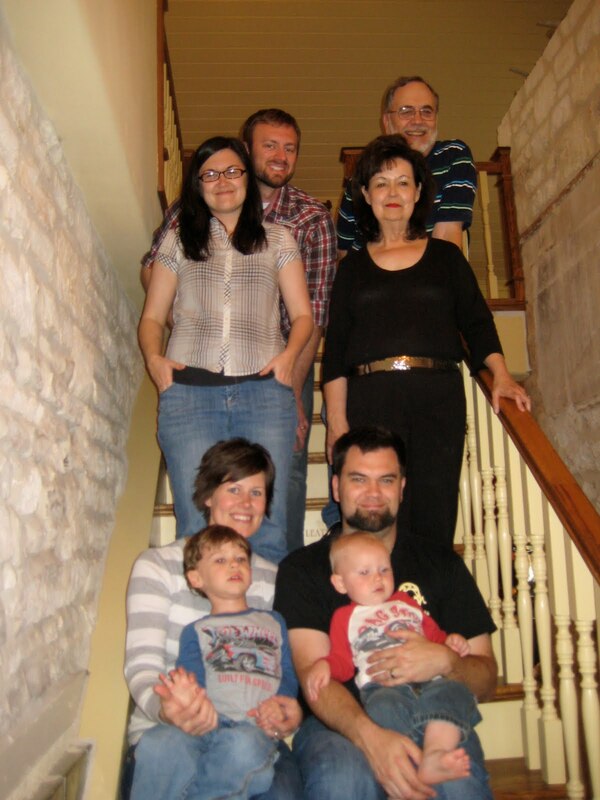 We had a great week in Fredericksburg! To recap, we celebrated my Great Grandma Ethel's 106th birthday with some fantastic chocolate cake and pulled pork sandwiches. We had beautiful weather about every other day, disbursed with really cold windy weather. 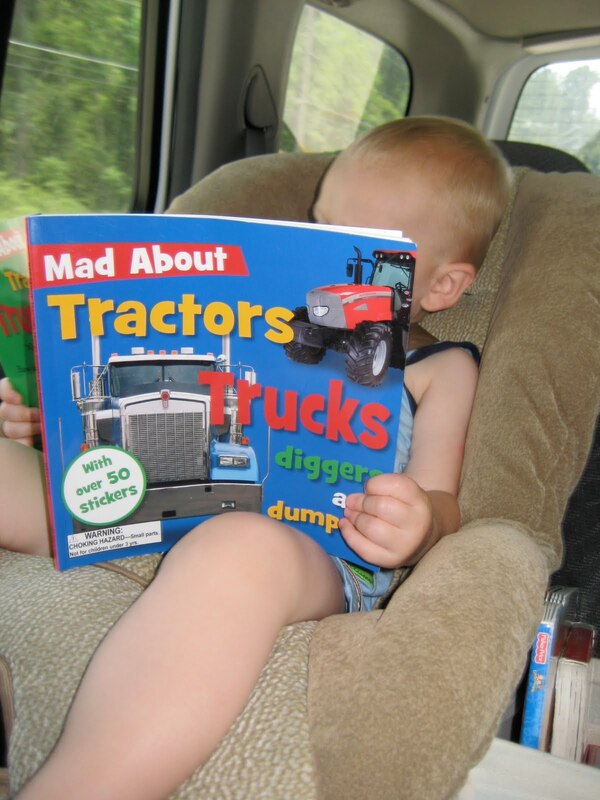 Unfortunately, Jax did not grasp why he could not ride the tractor every day, all day. He was not happy being couped up inside. The boys had a great week riding the tractor and planting tomato gardens and spreading wildflower seeds. I love their time in the "country". Then, we went to LBJ Ranch where they have a working farm with volunteers dressed up in settler attire and talk to the kids about how they did things on the farm. We will go back everytime we are there. It was awesome! Then Grammy and Papa came down and we had our annual Leatherman Reunion with 35 of Russ's relatives from all over Texas and New Mexico. Tye had such fun with his 6 cousins, and would wake every morning asking if they were still there. We had a great time visiting and shopping. Whew...are you tired reading this yet? I will wrap it up, but nonetheless, it was a great week, and we are thankful for family and family homesteads to retreat to. Here are a few pics from the week. So, Tye has become quite the conversationalist. He talks about the most random things sometimes and it has really started to crack us up. Yesterday morning, we were sitting at the breakfast table talking about farm animals and Tye said to me, "Mom...I think cows poop milk." I needed time for a response, so I replied brilliantly with..."I don't think cows POOP milk." 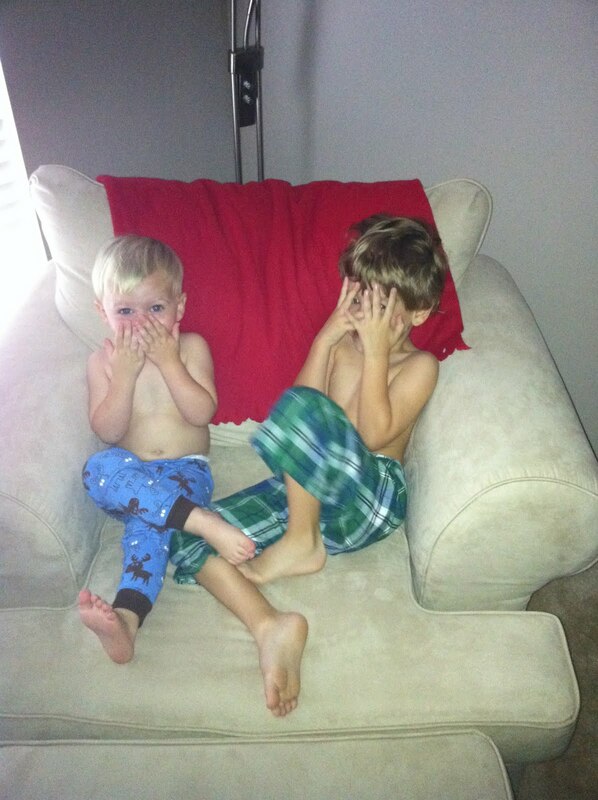 Then Tye thought for a second and said, "Then, I think they pee milk.". Then we began our conversation about udders...great morning table talk! Last week at Mother's Day Out, they had Chef Sonya come to school and help them make personal pizza's. Tye was so excited about it, and on the way to school, I asked him, "Tye do you remember who is coming to school today?" Tye replied with, "YES, OF Course! Chef Lasagna is coming today!" How appropriate, I thought. Hope you got a giggle out of this like I did. Jax dive bombs a pile of laundry now! 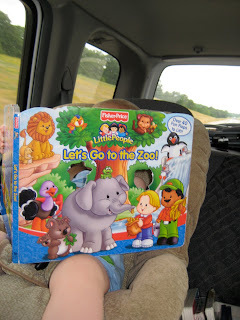 Tye set us a zoo/farm/safari with every little people animal and person we own. Quite a set up. Happy Birthday to you-ooo, happy birthday to you! 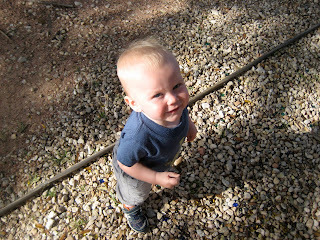 Well, my baby is now 1...not only is Jax 1, but we had a 3 generation birthday party on Sunday. Jax turned 1, my sister turned 20-something and my mom turned 50-something :) (your welcome Mom and Nat). Their birthdays are January, 22nd, 24th, and 25th. 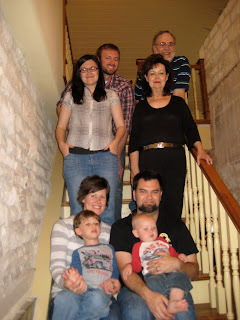 We had a fantastic family party with yummy fajitas, tuxedo cake, and cards and dominoes after the kids went to bed. We also had Jax's baby dedication that morning at church. Thank you to everyone who came. 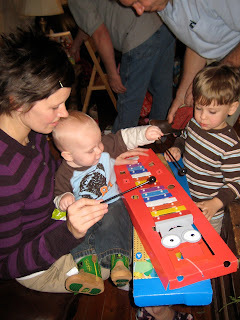 Jax did not lack in the gift assistant this year...there were plenty to help. Fun with the cake...of course my children to do not dive in for those famous pictures, but at least Jax enjoyed a few bites. That is more than I could say for Tye...but the smile is worth a million bucks and a barely eaten cake. Like Father...like son. Jax has this crinkly nose thing. I think he got it from my Mom because she crinkles her nose when she smiles and she does that a lot. But then, I noticed how much he looks like Russ when he does it. Love these boys! Laura...here is an example of our kid's "love/hate relationship" as well. Music time in our tent when it was like 20 degrees. I was not leaving my house! I live in the south for a reason. The boys are loving each other. Click on the picture and check out Jax's static hair. It shows that his hair does exist. :) He is walking now, but my video did not load properly, so I will have to get that us on the next post. I promise it won't be a month from now. 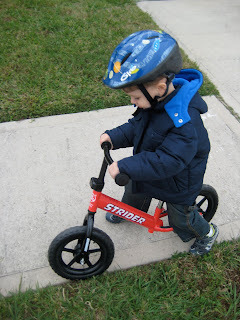 Then it turned 70 degrees and we were back outside again. Here are the boys fighting over a ball...hence the hate form of the relationship. Stay tuned for pictures of Jax's first birthday! So he can't quite say his "th" sound yet, so he keeps saying, "I'm free". Cute. Okay, so I am way late on postings and finally getting a few minutes of evening time to catch up on things. Don't get me wrong, I am enjoying every party, planning of party, and spending time with friends and family as we celebrate Christmas this month, but whew, it is nice to have a little breather. All that to say...I am going to have to skip a Thanksgiving post, and know that we had an awesome time in Dallas with Grammy and Pappa and Aunt Libby and Uncle Ethan, riding a train to the Railway Museum (every 2 year old train lover's dream day), and fishing and riding tractors at Uncle Lynne's, and jumping in huge piles of leaves. Last week we celebrated Tye's 3rd birthday! If you asked him what kind of party he wanted, he wanted a "Green Train Party" aka: Percy the Train Party. So a Green Train Party we had and boy was it fun. We had a good ol' family party and thanks to my Mom, Dad and Aunt Natalie, a cardboard box Percy attended the party. Tye and the kids loved every bit of it. They played in it for hours with their flashlights and train engineer hats. Thanks to Grammy and Pappa for coming down for the party, too. Here are a few pictures! Oh yeah, and we had SNOW!! 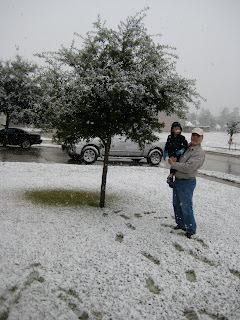 Tye was not a huge fan, he is cold in 70 degree weather, so he just wanted Pappa to make the snowballs so he could throw them from the garage. He is spoiled with the 90 degree weather. I say spoiled, bc I am a fan of the heat. Russ on the other hand is not a fan of the 90's. Either way, it snowed!